Info: At last! Anthroquinone- free Chipotle just arrived in the UK! 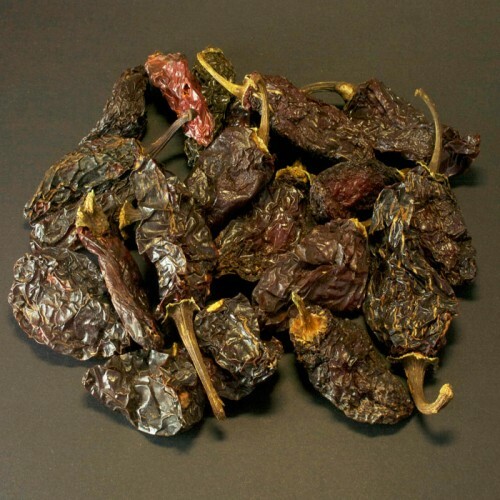 This is a ripened jalapeno which is then smoke-dried. The result is a dark red to dark brown, wrinked pepper with a wonderful smoky, almost chocolatey, aroma. They can be used for any dish to achieve that bbq flavour or as a replacement for bacon in vegetarian dishes. They can be lightly toasted first to really bring out the flavour. Rehydrate them in boiling water for no longer than 20 minutes. They work fantastically with chicken, pork, beef, to pep up a tomato sauce, or to flavour any salsas, stews, soups. No wonder this is our best-selling chilli. Comes whole, flakes or powder.